In Ireland, a person who buys disability products is eligible for VAT relief. The term, ‘disability’, in this case, refers to people who suffer from both mental and physical disabilities. In this article, we will explain the criteria a person must meet and the processes they must follow in order to obtain VAT relief. You must live in Ireland. You must have a disability. You need the aid or appliance of a disability product to help with daily activities. Necessary domestic aids. Examples include eating and drinking aids and mobility aids. Lifting seats and specified chairs for the physically disabled. Hoists and lifters, designed for invalids. These include stair lifts. Braille books for the blind. Communication aids for those unable to speak. Reclaiming VAT is only eligible if the disability products, or daily living aids, are bought and used by that sole person with a disability. This means that schools, hospitals and hotels etc. do not meet these criteria. 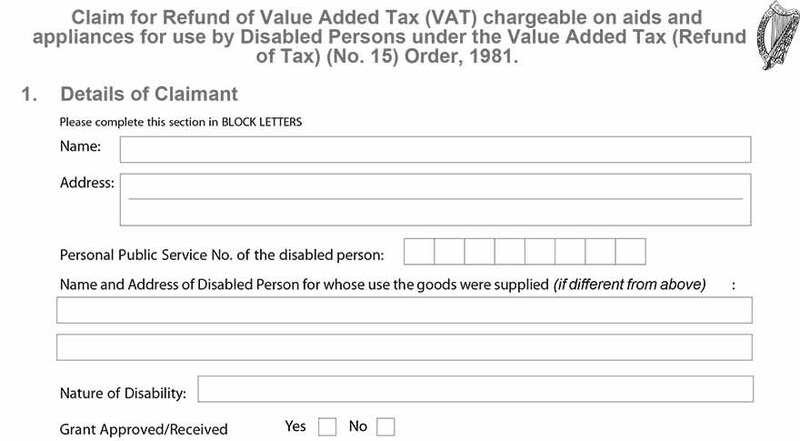 VAT refunds are not allowed on services for people with disabilities or rented aids and appliances. The criteria does not include products that are hired or rented. If a person buys the product for a loved one, the Revenue can contact that person and request proof that the product is used solely by that select person with a disability. It may also be required that a person provides medical evidence of their disability when claiming for VAT relief. The relevant claim form you need to fill out and send into Revenue when applying for VAT relief is called the VAT 61A form.